This simple 5-Ingredient Spicy Bacon Wrapped Dates with Goat Cheese Recipe is perfect for parties or romantic evenings. Each savory-sweet bite is packed with heat! 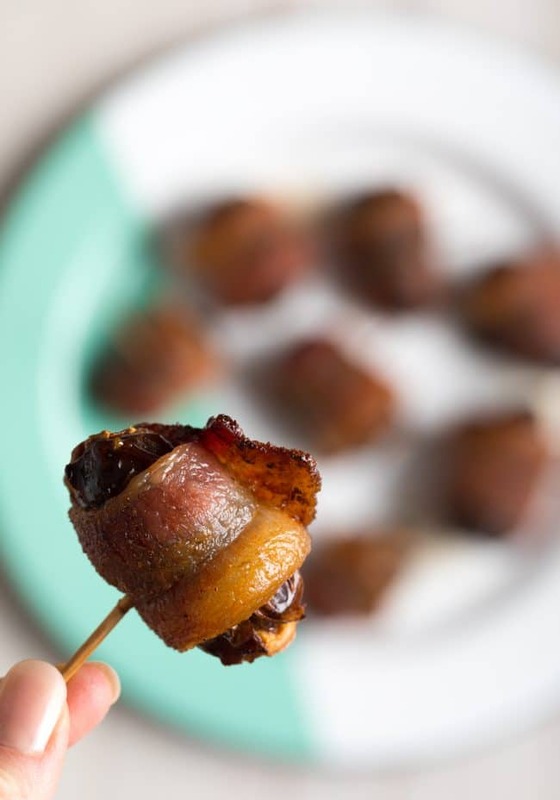 Bacon wrapped dates have been a classic party appetizer for centuries. They originated in Great Britain under the name Devils on Horseback. This classic pub snack may have gained its unique title from the dark red and black coloring combination, although no one really knows. 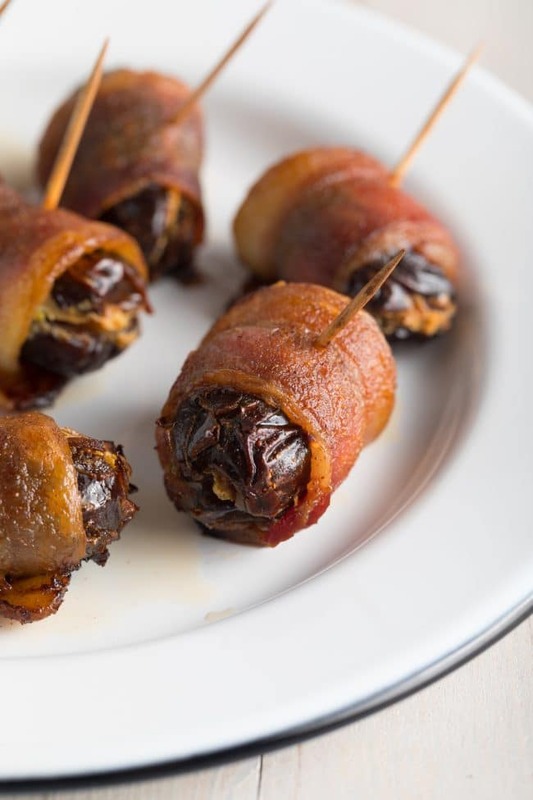 Traditional recipes involve dried prunes or dates stuffed with cheese or nuts, then wrapped in bacon, and baked until crispy. Because dates are so sweet, the salty bacon and tangy goat cheese balance its flavor extremely well. However, I feel one further step must be taken to fully offset the intense sweetness of the dates. In my opinion, they need a little spicy heat. That’s right! Sweet, spicy, salty, creamy, crunchy… These Spicy Bacon Wrapped Dates with Goat Cheese offer dazzling flavor and textural appeal! Remove the date pits – Cut the dates in half and pull out the pits. Spice up the cheese – Mix shaved jalapeno pepper into goat cheese. At some markets you may be able to find chevre goat cheese already flavored with jalapeños. 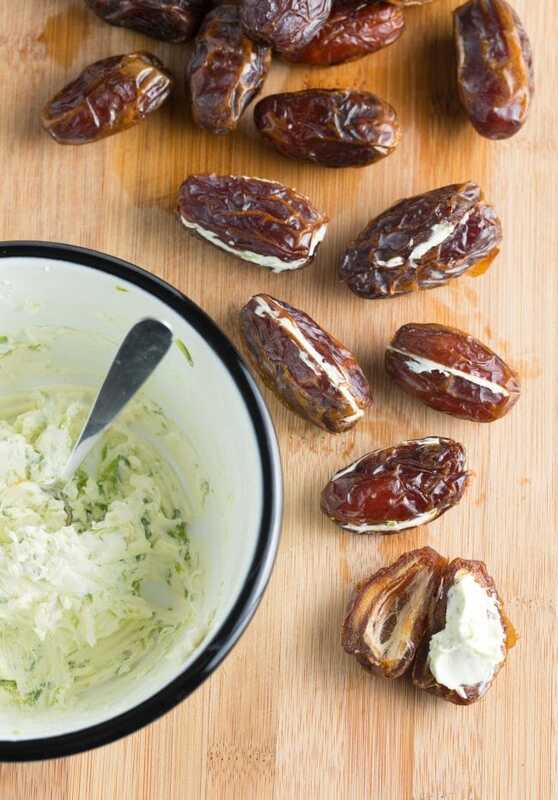 Stuff – Spoon the goat cheese into the dates. Then close them up. Wrap – Wrap bacon around each date. Bake – Sprinkle the dates with cayenne pepper and bake! 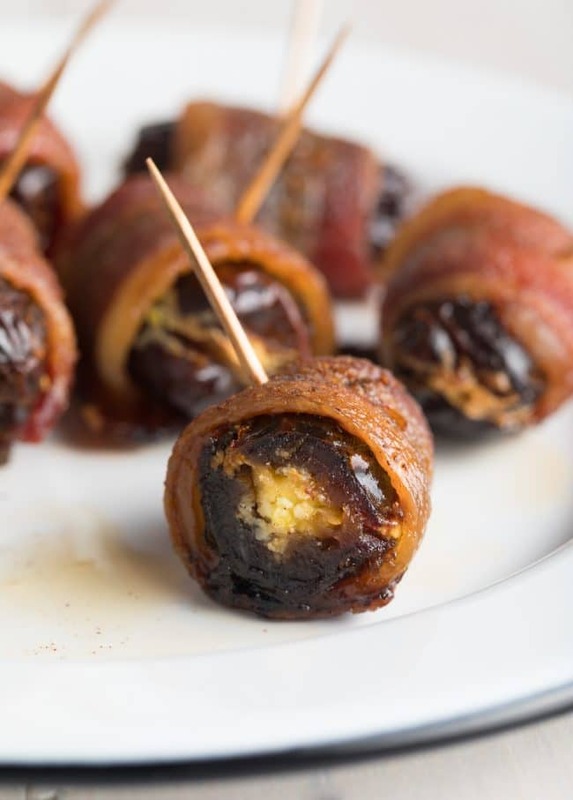 Get the Full (Printable) Spicy Bacon Wrapped Dates with Goat Cheese Recipe Below! How do you remove a pit from a date? Press a paring knife into the center of a date. Make a small incision and squeeze out the pit. If the size of the cut doesn’t matter in your recipe, you can simply cut the dates in half to remove the pits. 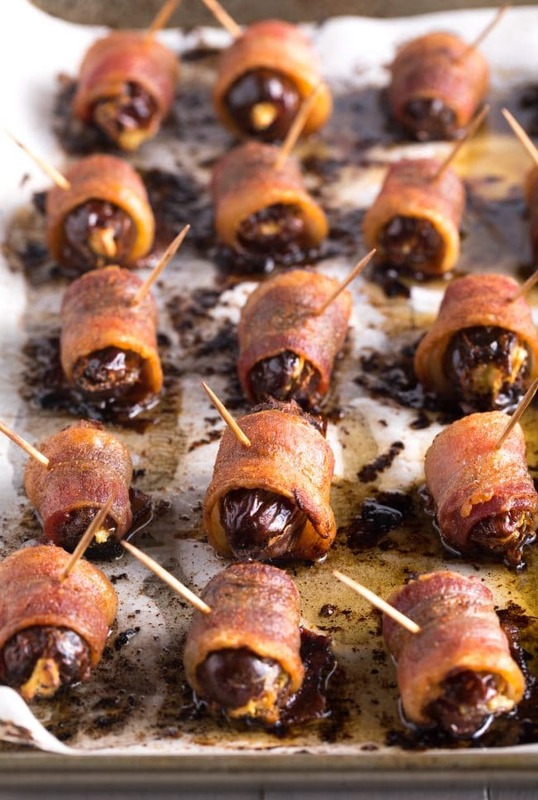 How long do you cook bacon wrapped dates? Approximately 20-30 minutes, depending on the thickness of the bacon. 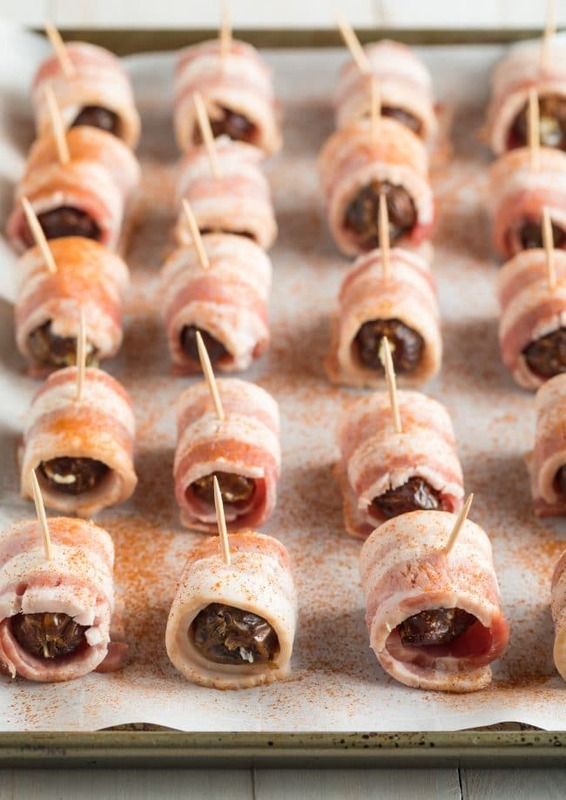 What temperature do you cook bacon wrapped dates? 400 degrees F is the best temperature for baking bacon wrapped dates. The high heat allow the bacon to crisp, without over cooking the date. How long do bacon wrapped dates last? Keep your bacon wrapped dates in the refrigerator for up to one week. Can you freeze bacon wrapped dates? Yes! Thaw them at room temperature. Then reheat in the oven. 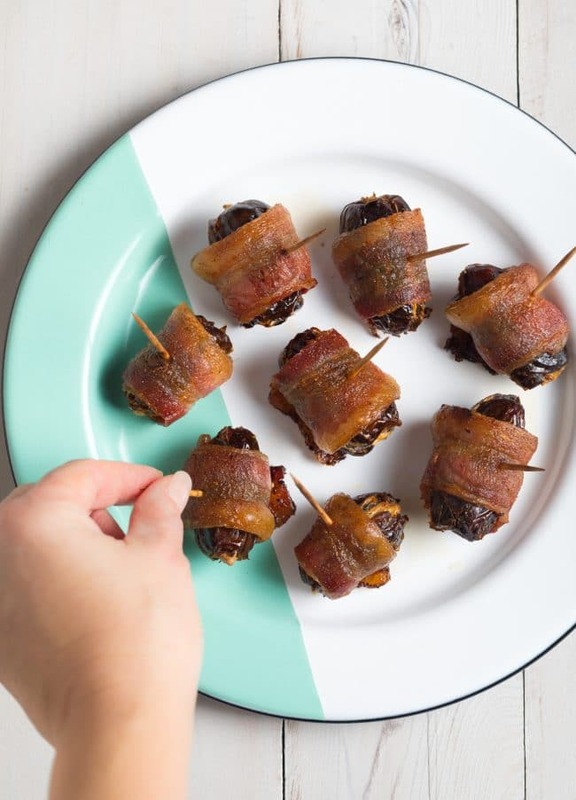 This simple 5-Ingredient Spicy Bacon Wrapped Dates with Goat Cheese Recipe is perfect for parties and events. Each savory-sweet bite is packed with heat! 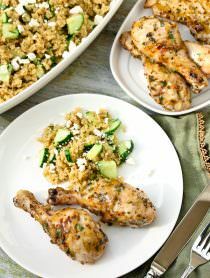 Preheat the oven to 400 degrees F. Line a large rimmed baking sheet with parchment paper. Use a grater to shave the jalapeno into fine pieces. In a small bowl, mix the goat cheese and jalapeño until smooth. Use a small paring knife to cut the dates in half, leaving them attached on one side. Remove the pits. Stuff the date with the goat cheese mixture, then press them closed. Wrap each date with half a bacon strip. Secure the ends of the bacon by sticking a toothpick all the way through the date. Lay them on the baking sheet. Sprinkle with cayenne pepper. Bake for 20+ minutes until the bacon is red and crispy. Depending on the thickness of your bacon, these may take up to 30 minutes to bake. OMG! I am obsessed with these stuffed dates! So delicious! 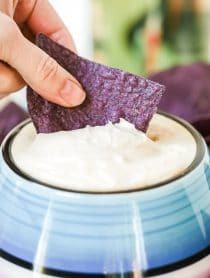 These were knockout delicious – and so easy! Cant wait to make again. These look like delicious little bite size poppers! Can’t wait to give them a try!! I love bacon wrapped anything. this is fabulous! These look and sound so amazing! 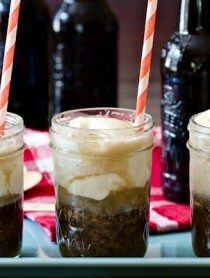 I have to try them asap!!! Such an amazing appetizer! Can’t wait to make it again for our next party!! Our guests RAVED about this one! I loved these! I wasn’t sure about the cayenne, but it really added a delicious element! This has become one of our favorite appetizers, no!